AutomatedBuildings.com Article - Smart Parking Garages? I know what you’re thinking. What could possibly be “smart”, you are just parking the car. What follows is an overview of the technology and systems to make parking garages smart, as well as a discussion of how such facilities enhance security, save people time and gas finding a parking space, and provide information that can be correlated and utilized to manage and track employees, customers and visitors. First, let’s differentiate between robotic parking garages and smart parking garages. Robotic parking garages use a series of lifts and pallets to automatically “park” or store cars in storage bays. When you park in a robotic parking garage, you pull your car onto a pallet that is inside a lift. You lock it, leave it and go about your business. The pallet is then rotated 180° (so when it is retrieved, it is in a position for you to simply drive out), lifted and rolled to a storage bay. The beauty of the robotic system is the space efficiency. You use less headroom per floor and you don’t need space for drivers to drive to a space or space for walking between cars. You pack the cars in. It’s a great solution for dense urban areas where the cost of land is at a premium. Smart parking garages are different. They use cameras, digital signage, sensors and software to gather data on vehicles and parking spaces. Then the information is processed to more efficiently manage parking spaces, guide drivers to open parking slots, identify the owners of the cars parked in the facility and interact with other building technology and business systems. How does it work? At the entrance into the facility, cars come in and go over a speed bump to slow the car down or a magnetic loop detector signals the presence of a car. A camera then takes a picture of the car’s license plate. The camera setup includes an infrared light (not visible to the human eye) which illuminates the license plate and then snaps a picture. The picture or pixel image is then analyzed in a process similar to Optical Character Recognition (OCR) software. The license plate number is then stored in the system or correlated to a database of license plates, along with other data (time and date, parking space allotted, picture of the driver, etc.). 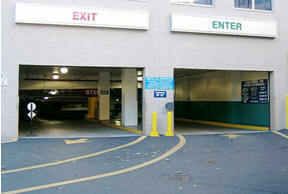 After the car enters the facility, the system determines the parking place it should use. Each parking place in the facility has an occupancy sensor and a light associated with it. The sensors provide information on how many parking places are vacant and where those parking places are. The system turns on the light above the parking place that should be used and it uses digital signage in the facility to direct the driver to the parking space. The car pulls into the parking space and the occupancy sensor senses the car, notifies the system of the occupancy, which then turns the light off above the parking space. After parking the vehicle the driver goes about his or her business and then later returns to the car to leave. When the car is backed out and moves out of the parking space, the occupancy sensor senses that the space is no longer occupied. This then triggers digital signage that directs the car to the exit. There, the license plate is again scanned and recognized, the time parked is calculated and logged, and then appropriate charges are displayed on a digital sign, with automatic payments for pre-paid drivers. • Efficient Parking – The system can provide real time management data on the number and location of parking spaces available. Drivers no longer search for a space or drive in circles, but instead drive directly to a space, reducing emissions. • Security – The system can cross reference the license plate to employee lists and authorized visitors’ lists. • Exceptions List – The license plate number can be used to identify VIPs that may get special treatment or have special parking areas. It can also identify “blacklisted” cars that are denied access into the facility or trigger an alarm or notification. • Marketing and Management Reports – The systems can produce a list of frequent cars and drivers using the facility and management reports such as the number of entries into the facility by hour by day. • Tie-in to Other Systems – The system can be tied into other building or business systems. For example, if an employee enters the parking garage after working hours, the employee’s office lights can then be turned on and the serving HVAC zone can be activated. Upon leaving the parking facility, all the systems are turned off. Integrated building technology systems can improve the functionality and value of buildings, even those such as parking garages. Increasingly, technology will shape how a variety of facilities will be managed and how users will work, live, even park their cars. For more information about smart buildings, technology design or to schedule a continuing education program write us at info@smart-buildings.com.